Parents and College Admissions Essays: In or Out? First, understand that your parents are on your side. They just want you to have success, and think they can help you. It’s your job, however, to show them how to help. The best way to fend off pesky parents is to prove to them that you have it covered. Tell them where you are at in the process, and that you have put together a timeline for yourself. Simply knowing that you have started will relieve anxiety. Some parents, however, are certain they can help you write your essay. This is where you need to help them understand how critical it is that this is your essay, in your words and voice alone. Tell them this, nicely. Another way to shield yourself from parental intervention is to see if there is a place or specific role where they can help you, but not take over the process. No one knows you or your life like your parent. If you need help with topic ideas, ask them if they would brainstorm with you. Set a time when you both are in a good mood and not tired. Once you have a rough draft, and trust they won’t overtake your piece, let them read it and ask for feedback. Again, watch your moods. Ask them to just tell you what they like, and any places that are unclear or might need more work. Finally, it never hurts to have your parents read your final version to help check for punctuation, spelling and other errors. Writing is hard, and can make you grumpy. This is usually about the point where your mom or dad will come in your room to “help,” and you want to strangle them. Instead of yelling at them to “Back off!,” try just telling them that you are working on the essay, and will ask them for help when you need it. Say it nicely, and they will magically go away. Remember, no one else will care as much about your essay as your parent. If you let them help a little, they might not feel the need to help too much. 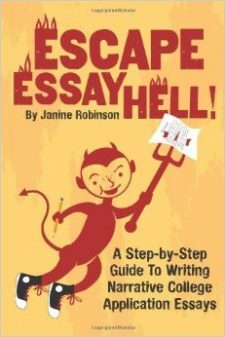 Ready to start writing your essays? Try my Jumpstart Guide!